Opera TV is continuing to expand its partnerships to enable millions of video content creators to quickly and easily distribute their content on millions of Smart TV devices around the globe. JW Player, a leading digital and mobile video platform and player company with customers ranging from individual bloggers to Fortune 500 companies, is the newest Opera TV Snap partner. Together, Opera TV Snap and JW Player will enable JW Players’ over two million supported websites to package online video channels into ready-to-run TV apps. First launched in 2013 supporting only one video platform, the next-generation Opera TV Snap is now a one-stop shop for multiple platforms including Brightcove Video Cloud, DailyMotion and channel formats like Media RSS (MRSS). JW Player users can quickly create a Smart TV app right from their video catalog, thanks to the pre-integration of Opera TV and JW Player clouds. 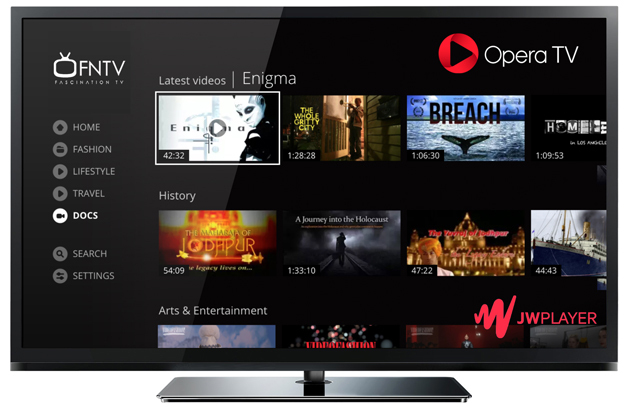 Seamless integration between Opera TV Snap and individual JW Player video catalogs dynamically loads content, speeding the launch of apps for millions of Smart TV, Blu-ray player and set-top devices worldwide. And, it’s all free of charge to JW Player users. Opera TV Snap is an industry-first, cloud-based turnkey solution, designed to provide content owners with the opportunity to drive seamless distribution of on-demand and live OTT content on tens of millions of Smart TV devices. By pre-integrating with popular cloud-based online video platforms and pre-porting an app experience on popular connected TV Platforms, Opera TV Snap aims to make everyone in the content distribution value chain, a winner – from content owners to end users. Notable partners that have released Smart TV apps were created via Opera TV Snap’s platform include Conde Nast Traveler, COPS, Deutsche Welle, Fashion TV, GTChannel, GQ, IGN, MLG, The New Yorker, The North Face, Paula Deen, TED, Vanity Fair, Vogue, The Washington Post, Young Hollywood, and many more. These apps and more are now available through the Opera TV Store. The Opera TV Store application platform ships on on tens of millions of devices each year including Smart TVs, Blu-ray players and set-top-boxes from Sony, TCL, TiVo, Samsung and Hisense, among many other manufacturers. Getting your content in front of audiences is easier than ever. Whether you are an established brand with thousands of hours of high quality content, or a novice building a following, if your content is ready for prime time you can transform your online video channel into a TV app by visiting opera.com/tvsnap/ and clicking “Get started.” Simply add the details for your channel on JW Player or other video platforms and your TV app will be generated in under a minute, and ready to submit for moderation.